We’d love your help. Let us know what’s wrong with this preview of The Land Girl by Allie Burns. Emily has always lived a life of privilege. That is until the drums of war came beating. With her father and brother fighting on the front it’s up to her to maintain their family estate. Working as a land girl Emily finds a new lease to life but when the war is over will life ever be the same again? To ask other readers questions about The Land Girl, please sign up. For the first time in a very long time, I read a book in a single day. I could not put The Land Girl by Allie Burns down, I was so invested in Emily's story. It's a beautiful story, and I absolutely recommend it. Thanks to Netgalley and the publisher for a copy of this title in exchange for an honest review. I've really enjoyed reading this, it was a different book to what I usually read and I'm so glad I took that step. The best part of the whole book is the characters, they are so full and well built they come out of the pages. Emily is such a strong, kind, honest girl you can't help but love her and feel every up and down of her life with her. The era portrayed in the story was interesting to read abou Thanks to Netgalley and the publisher for a copy of this title in exchange for an honest review. The era portrayed in the story was interesting to read about, the war, the land girls and the movement of the suffragettes . 3.5* for this one. I enjoyed the story and the characters, but felt the story could have been more in-depth. Much action seemed to be glossed over or summarised. I also found a few inconsistencies which tripped me up in my reading. Overall I enjoyed the story though and learnt much about Britain in WW1. 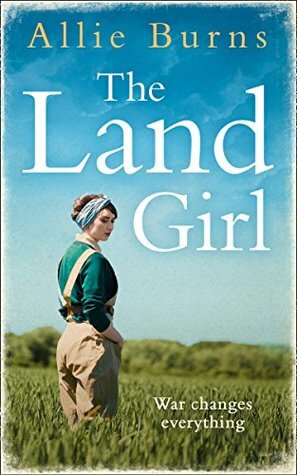 Many thanks to HQ Digital and #NetGalley for allowing me to read a copy of the Land Girl in exchange for an honest review. The opinions I express are entirely my own. When I first saw the cover and title of this book I thought it would be set in the time of the Second World War which is a time that fascinates me. I had not realized that Land Girls were also a big part of the Great War. Burns shows very clearly in this novel the class differences that existed during that time between the rich and Many thanks to HQ Digital and #NetGalley for allowing me to read a copy of the Land Girl in exchange for an honest review. The opinions I express are entirely my own. When I first saw the cover and title of this book I thought it would be set in the time of the Second World War which is a time that fascinates me. I had not realized that Land Girls were also a big part of the Great War. Burns shows very clearly in this novel the class differences that existed during that time between the rich and the working class and also between women and men. It made me thankful that I live in the time that is now which allows me so many opportunities as a woman. The story begins early in the first year of the war. Emily, the heroine of the story, is weighed down by the burdens of her Mothers expectations and her brother John, home on leave from war, has come to the realization that this war will not be done by Christmas. Her other brother Cecil is clear in his belief that it would be wrong for him to serve in the war in any way at all, a decision which will have an impact on his whole family. Emily has a love for the land and has always done her best to learn what ever she can about managing her family's land and animals. When she learns that women can sign up to work on the land as war work she is determined that this is what she must do but she faces stiff opposition from her mother. Over time she is eventually able to follow her dream and do the job well. Along the way she will inspire those around her, face tragedy, marry and bear a child and stand up for the rights of her fellow land girls once the war finally comes to an end. The Land Girl charts one young woman’s struggle to break free of the bonds of societal norms. The advent of World War I heralded a new era, one where the division of the classes and gender roles became blurred as we worked together to defeat a common foe. The world as we knew it was gone forever. Emily’s story had me riveted from the off. Filled with passion and spirit, and more gumption than I could ever hope for, Emily is one of those characters that ignites your own inner fire. You want to nu The Land Girl charts one young woman’s struggle to break free of the bonds of societal norms. The advent of World War I heralded a new era, one where the division of the classes and gender roles became blurred as we worked together to defeat a common foe. The world as we knew it was gone forever. Emily’s story had me riveted from the off. Filled with passion and spirit, and more gumption than I could ever hope for, Emily is one of those characters that ignites your own inner fire. You want to nurture her, and watch her grow - just like one of those seedlings she so tenderly cares for. For she is something special. This was a poignant, heartfelt, heart rending, uplifting (enough adjectives for you? *snorts*) read of love and loss, and everything in between. For me, at the heart of this book is a love story, but not in the conventional sense. It’s the love that Emily has for the land, and the place she calls home. You could feel it coming off the pages, as Emily welcomes us into her world. I can’t recommend this book enough. I truly felt transported back in time, and can’t help thinking about where we would be today, as women, if it weren’t for the likes of Emily, Martha et al. I love a story that makes you think and want to engage. This book did both with bells on. Woe betide anyone that strikes up a conversation with me about this book - I don’t think they’ll get me to shut up *giggles* A bit like this review, I hear you cry! I previously read Allie Burns' first book, The Lido Girls (see my review here, but I was disappointed by it. I didn't realise The Land Girl had the same author when I requested it - the story sounded so interesting I had to request. I'm glad I did give Allie Burns another chance as The Land Girl was a compelling read. She definitely improved on all the flaws I found in the first book. I did notice a few repetitions, but nothing eye-rolling as it was the case before. I found a lot of the subplots I previously read Allie Burns' first book, The Lido Girls (see my review here, but I was disappointed by it. I didn't realise The Land Girl had the same author when I requested it - the story sounded so interesting I had to request. I'm glad I did give Allie Burns another chance as The Land Girl was a compelling read. She definitely improved on all the flaws I found in the first book. I did notice a few repetitions, but nothing eye-rolling as it was the case before. I found a lot of the subplots predictable, although they remained enjoyable. It doesn't matter much that the story is predictable, as it is one of these novels you have to keep reading. The characters are interesting and varied, and it touches upon interesting issues of the time. I discovered a few new things pertaining to WWI, which is always a plus when I read historical fiction. You can tell the background is very well researched as you get immersed in Emily's world. Now I've seen how far Allie Burns has progressed since her last book, I will definitely be following her! Allie Burns has brought WW1 in the Garden of England to life. Just as she did in Lido, she has captured class differences, mother and daughter tensions and massive social change of the time, while her main character, the spirited Emily, is an inspiration for any woman today who wants to fall in love and do her own thing. Burns sensitively shows the bereavement of war and the ordeals of conscientious objectors and those stories vividly draw you in with her thoughtful insights into how the war was Allie Burns has brought WW1 in the Garden of England to life. Just as she did in Lido, she has captured class differences, mother and daughter tensions and massive social change of the time, while her main character, the spirited Emily, is an inspiration for any woman today who wants to fall in love and do her own thing. Burns sensitively shows the bereavement of war and the ordeals of conscientious objectors and those stories vividly draw you in with her thoughtful insights into how the war was experienced in people’s real lives. Meanwhile, her portrayal of the orchards and farmland of Kent – described as Emily’s “beautiful corner of Blighty” – is the work of an author who pays attention to every tree, branch and leaf. It’s another winner from Burns, and I can’t wait to read book three. It took me a few pages to get into this book but once in I couldn't put it down. Interesting and very realistic characters grappling with issues we're so lucky we never have to deal with. There's such a strong sense of time and place in this novel; Allie depicts the grief and turmoil felt by everyone in the First World War, the confusion and uncertainty of it all, but also writes so well about the shifting attitudes towards working women. It's packed with historical d A moving, entertaining read. Emily is frustrated by the restrictions on her priviledged life, the expectation that she will marry well and produce a family regardless of what she wants herself....... so when world war 1 starts she sees an opportunity to get away from her mother and do something for her country as a land girl. Never having had to get her hands dirty before it is a hard life but she revels in it and had never been happier...... but what will happen at the end off the war will she have to go back to her previo Emily is frustrated by the restrictions on her priviledged life, the expectation that she will marry well and produce a family regardless of what she wants herself....... so when world war 1 starts she sees an opportunity to get away from her mother and do something for her country as a land girl. Never having had to get her hands dirty before it is a hard life but she revels in it and had never been happier...... but what will happen at the end off the war will she have to go back to her previous life? I absolutely adored this book! I love reading about different eras and what they went through. This book nailed it completely! Everything was very well written, and the story line was great. I started reading this book at bedtime (because I'm a rebel..haha) and I stayed awake until it was finished, because I couldn't put it down. It kept me engrossed, and was never boring at all. It was a very interesting book, and I easily could, and probably will, read it again! I loved this book. It combines World War One with the beginnings of the suffragette movement. It was lovely to read a book set in this time from the women’s perspective which was relatable to the struggles that many woman have today. I really enjoyed this book. It was a really interesting glimpse into a part of history that I'm fascinated by and with great characters. I wasn't familiar with the author beforehand but will definitely look out for more by her in the future! A very good read for those looking for old fashioned storytelling and historical fiction. Set during WWI, it focuses on Emily, who finds herself working as land girl. She's got a lot to learn, not only about agriculture but also about life and people. It's an interesting character study. Thanks to Netgalley for the ARC. For US fans of certain BBC dramas on PBS (you know who you are! ).